Great for Retailers, Merchants, & Vendors in Shops, Storefronts, Online, in Flea Markets, & More! A continuing trend in women's fashion is western handbags and at Best Handbag Wholesale we offer a great selection of discount purses in popular western styles so retailers can keep their customers satisfied. From rhinestone peace handbags and genuine leather clutches to cow print messenger bags and hair on hide satchels our online inventory is full of classic and contemporary western purses that will make your retail shop or flea market stand the place to shop. 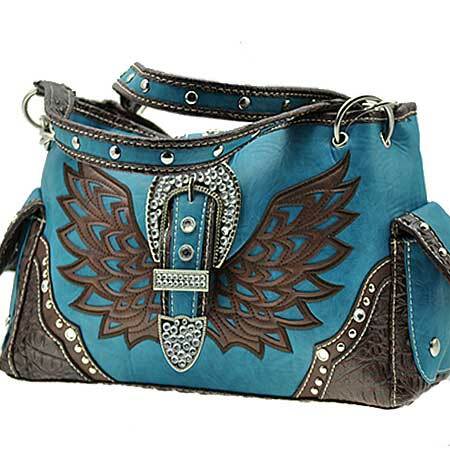 One of the more popular styles of western handbags is the cross model and we have a great selection of rhinestone, turquoise and cow print cross designs on a number of stylish bags including totes, duffle bags, clutches, satchels, Kelly bags and messenger bags. The cross symbol is synonymous with western culture and our handbags feature a wide variety of cross designs that encompass the true spirit of the American west. Choose from hair on hide, genuine leather and animal print materials to meet the demands of your loyal customers. With Best Handbag Wholesale you get the benefit of variety and discounts so you can fill your store shelves with high quality western handbags. When you register to create an account with us you get access to hundreds of handbag designs at great wholesale prices. Our wholesale western handbags include modern skull and cross bone designs as well as rhinestone peace symbols and giraffe and zebra print styles. Many of our wholesale handbags feature soft washed leatherette material, two chain and leatherette straps, two side pockets and top zip closure for a convenient and stylish bag. At Best Handbag Wholesale we aim to please and constantly update our handbag inventory with new and chic western styles to keep your customers coming back for more. Check back frequently to find discount western women's purses in many styles to make your retail store the place to shop for the latest in western fashion accessories. Here at Best Handbag Wholesale we offer a variety of purses, belts, and other accessories at wholesale prices. One of our most popular items is our wholesale western purses. We offer many different styles and designs, giving our customers a wide variety of options when choosing which bags they want to sell in their store. Our collection of wholesale western purses has something for everyone. We have purses with Velcro, zippers, adjustable shoulder straps, cell phone pockets, inner compartments, and many other features. All of our western purses and handbags are designed to be stylish and practical. Everyone wants a bag that not only looks good, but has some functionality. We understand that everyone has a different taste, so we offer many different designs as well as styles. We have a huge variety of western styles that can have colors that range from fuchsia to black, camouflage, soft reptile print, and cross designs. Our western purses not only come in many styles and designs, but they come in different fabrics. You can choose from high quality fabric materials that include, genuine cowhide leather, ostrich print leatherette, soft leatherette, and denim. When choosing which western purses you want to carry in your store, keep in mind that we have an assortment of wallets, change purses, accessories, hats, flip flops, and jewelry that are a great accent to the purses. Your customers will love having different accessories that will go along great with the new western purse that are purchasing. All of our items at Best Handbag Wholesale are offered as wholesale purchases only. We have hundreds of different bags to choose from, allowing you to keep fresh product in your store all year around.